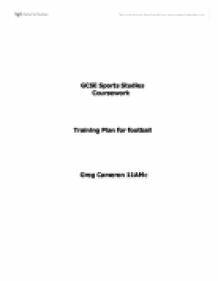 GCSE Sports Studies Coursework Training Plan for football Greg Cameron 11AMc Greg Cameron Sports Studies coursework: Training Plan Jan 06 11 AMc Football Purpose/Aim of training programme in relation to prior fitness, performance levels and any injuries/health problems: o The purpose of my training programme is to provide a guideline for myself to follow when exercising my six week programme in my chosen sport football. As well as this it will also target my areas for improvement (my weaknesses) whilst maintaining my current strengths. 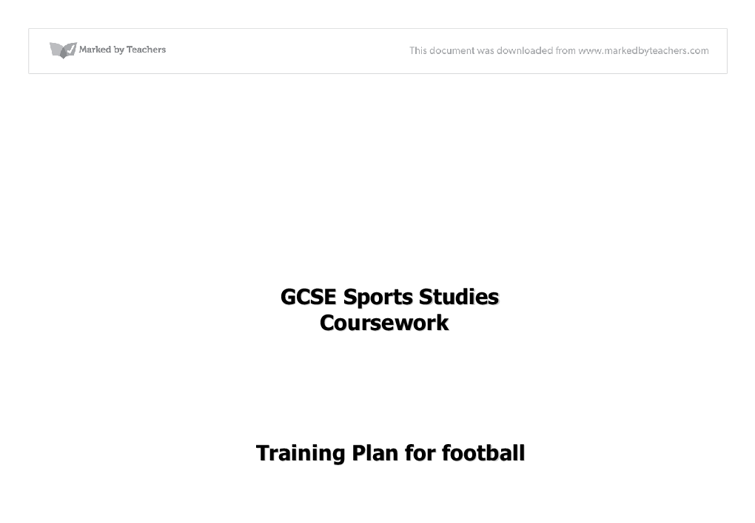 These will include both skill exercises (involving a football) and health related fitness exercises (e.g. anaerobic and aerobic training etc). It will ensure that I am training at various intensities and recreating a match like atmosphere for some situations. The programme is aimed at improving my knowledge of the game in terms of skill; it will open up my use of skills such as dribbling and accuracy of my shots, passes and crosses allowing me to perform consistently at a higher level of skill. In terms of fitness it will ensure that I am performing at a high intensity for a long period of time and preparing myself for the rest season allowing me to be at peak fitness for the season. o Within my programme I will be targeting several aspects of fitness that will help me improve in sport, these will be; aerobic fitness, anaerobic fitness, agility, muscular power, muscular endurance speed and skill related aspects of football as well. However although my programme will target these, my programme will specifically focus on two of the aspects above and then focus on specific areas within them. The two aspects I will be focussing on are my accuracy with the ball (my skill focus) and my all round endurance (both muscular and cardio-vascular wise). I have chosen these two aspects because I think that by improving these two areas the most will be more beneficial to me in the long run than if I were to improve on ...read more. o RULES: I must be aware of all the rules within the game of football as this will ensure that my training is not obsolete, as this will not help to prepare me for a match situation as my training will be unnecessary. This includes rules within the gym that I will be doing sessions at as part of my training. This is also similar to that of gym work; I will make sure I am totally aware of the rules of training within the gym. o ETIQUETTE: I must also ensure that I know the rules of etiquette as this will also enable me to ensure that my training is appropriate and is not going to be a danger to myself or anyone else when I am in a match situation. o PREVENTION OF INJURY MEASURES: Initially the first way of preventing the risk of an injury is to follow all of the above focussing on warming up and down properly before and after training, however I will take into account what type of session I will be doing and assess if I need any support e.g. weight training may call for the use of elbow supports when bench pressing etc. o PHYSIOLOGICAL: As well as all of the standard safety measures that need to be considered, one of the key aspects is the physiological state that the training is going to be performed under. The skill related training specifically will be performed outdoors (but can be transferred indoors if needed), if the conditions are frozen then the training will either have to be postponed or moved indoors as the icy conditions are more likely to cause an injury. Wet conditions could cause the risk of injury due to slippery conditions however this shouldn't present a problem as the correct footwear should adhere to this (these type of conditions could be of benefit as it could re-create the conditions that a match may be played under so provide vital experience). ...read more. that I am at peak fitness for matches and am able to give more than my all in terms of fitness commitments without fatigue. o REVERSIBILITY: although all of the above will increase my fitness and skill levels within football I have to remember that fitness cannot be stored only maintained and it is with this theory that I must ensure that I do not slack off when training, I must stick strictly to the programme. My programme applies preventions to this well as it increases the number of sessions and duration of sessions each week without any one week being an exception although my training weeks has a rest day in the middle of the week(s) the progression of the intensity will help to counteract this. o TEDIUM: this is when the training becomes too repetitive and becomes boring this will affect my "drive" to push myself and give it my all when training and so may cause my training to become obsolete. In order to prevent this I will make sure that when doing the skill related exercises I am changing the positions every week of the passing, shooting and crossing targets every week, and I will rearrange the style of the course I am doing when doing agility training and dribbling training so each week the training presents a new challenge. Also as a non energy expending exercise I will be doing unrelated sports on the final day of each week for an hour in order to clear my mind of the training I have been doing for the 3-5 days a week, these sports will include, badminton, tennis, and swimming, this will mentally help to be relieved of the stress of the specific football training and help me to be fully prepared for the following week of training without having any premonitions about the training as well as also helping to increase my level of aerobic fitness (swimming), flexibility (badminton and tennis) and also my agility and anaerobic fitness (badminton). ...read more. able to pick out the correct response for certain stimuli, thus making my reaction time faster. Fatigue is an issue as when I become more tired my level of concentration will deteriorate, as a result I may not detect relevant cues and my reaction time will decrease. With over forty-thousand volunteers, the RFU try to reach every corner of the country and introduce them to the game rugby. The RFU also run the more elite competitions in the country. They control the England rugby team, the army 7s, the top tier of English club rugby and much more. Do not be lazy, you are only cheating yourself! Week 2 Monday If you look at sprinters you will notice they have impressive muscular figures, this is because they need their muscles to work as hard as possible in order to use their power which is a combination of speed and strength to go as fast as possible. The second reason is to increase oxygen flow into the muscles. The third reason is to help prevent early fatigue. The fourth and final reason is to increase muscle temperature; this leads to greater elasticity of the muscles, which helps prevent injury and gives a better performance. of the serves which are played on the right 3/4s of the table with his forehand rather than his backhand. He then also gets his bat low to the table as then it would save him time from bringing the bat from a high position to a low. recovery period, as you are making movements at speed for a short period of time. Stamina: the ability to work the body for a long period. The player needs to be able to continue to play to the best of their ability without tiring quickly. Players who let the ball run away from them are always under pressure, because they allow time for opponents to close them down, or even lose the ball completely. Control with the foot when receiving the ball requires a soft touch in which the foot is withdrawn or "cushions" on contact.